UNSURPASSED PRIME LOCATION! UNIQUE 104.14 ACRES WITH OVER 2,500 FT. OF WATER FRONTAGE ON INTRACOASTAL WATERWAY VERY CLOSE TO BROWNSVILLE SHIP CHANNEL & SOUTH PADRE JETTIES! There is nothing available on the water comparable to this! Seller has a master plan with 550 lots available for review. Good elevation. Deepwater. Two road accesses available. Survey & Wetlands assessment <acre on file. Timing has never been better for developing this track. The Port of Brownsville is expanding with LNG plant, possible SPI cruise ships & steel mill. SpaceX is under construction for launching rockets in 2019. There will not be a better view than from this property. The end use of this property can be residential or commercial. POSSIBLE SELLER FINANCING! Agent Remarks: This land was previously encumbered with liens and access issues but all of these issues have been cleared. Call listing agent Gayle Hood with questions. 956-459-9536. Deed restrictions if access is through Long Island Village. No restrictions if access is obtained through other Long Island property or across Intracoastal. 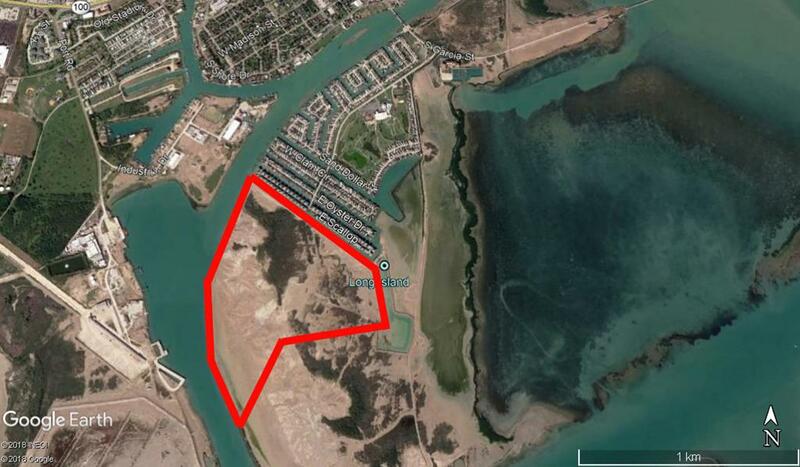 Perpetual easement of 5.9 acres with Port Isabel Navigation District along the waterfront.